The “Orange Army” was out in force from the 1st to the 7th July, taking part in the 52 mile “Tour of Merseyside“. 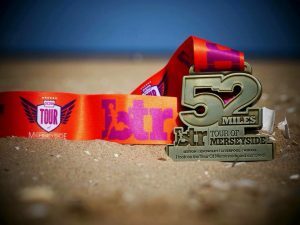 For the uninitiated; the Tour – a running challenge originally devised by the legend that is Ron Hill, and refreshed by BTR Liverpool in 2013 – consists of 6 different races across the course of a week, adding up to a total of 52 miles. It is a physical chllenge as runners try to balance pace against the need to ‘keep something in the tank’, nutrition and recovery needs, but is also so much more with a cammeraderie amongst both runners and volunteers as the week progresses. 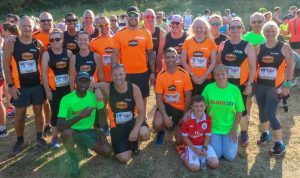 And the Road Runners weren’t just running, there was absolutely fantastic support throughout the week by the Stockers, Dave “High 5” Moore, and others on volunteering and support duties. The first leg of the Tour is always the Southport Half Marathon, where the ‘Tourists’ are guest runners. 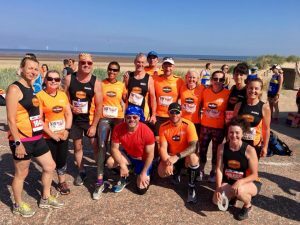 A nice flat route, but in 27 degrees temperature with blue skies and (almost) no wind, PB territory was never that likely, but there were some great performances going on, as the Road Runners made their way around the Sefton coastal resort in times ranging from 1:36 to 2:49. The second stage is always where the Tour really comes alive, with the 300-400 nutters (sorry, runners) using a challenging route that includes 2 miles on a stone-and-sand beach, before climbing off road up through the Heswall Dales, then back down for a fast straight run along the Wirral Way to the finish (fast for anyone with energy still left in their legs). At least there was *some* breeze that night! Great performances by everyone, with times ranging from 0:47 to 1:15. The third stage is an interesting one, making use of an old railway line converted into a Sustrans cycleway – nice and mostly even, with gentle gradients. 2.5 miles north, turn and back; 2.5 miles south, turn and back. Sounds easy, breaking it up like that, doesn’t it? One highlight of the race is always passing all the other runners and cheering each other on; another highlight can be some ‘local elements’ – most of who this year must have been indoors watching (COME ON ENGLAND) football. Hot and challenging in the heat, everyone dug deep, team times ranging from 1:13 to 1:54. Well, they all knew the following day was a rest day! 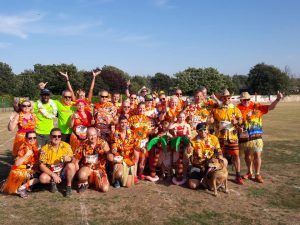 With the heat, most runners had gone more for a fairly minimal costume than in previous years, although some lareg pink flamingoes were spotted melting. BTR Road Runners adopted a Hawaian theme, and said aloha (sorry) to times ranging from 0:34 to 0:57. 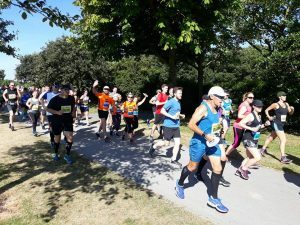 The penultimate race takes the form of 2 * 3-mile laps of Stadt Moers Country Park near Whiston, a hidden little gem that makes for some challenging running with sections of hills, twists and uneven terrain. 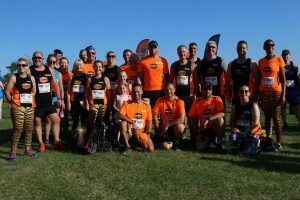 But this year there was a steady breeze which – together with the soooo nice stretches under the shade of trees at the far end of the course saw times ranging from 0:42 to 01:09. 10am Saturday, after a few hours sleep, and the Tourists reassemble on the prom at Harrison Drive. And then, somehow the finish line is there, with the most welcome race medal ever. 52 racing miles in one week – something for first timers to keep repeating to themselves. Another incredibly hot day, 25 degrees upwards, made hotter still by the concrete promenade reflecting back the sunshine – it’s quite possible the ice cream van by the finish (sorry, I never mentioned before, we did have ice cream support at every race!) was as welcome as the medal. More great performances by all the Road Runners, ranging from 1:29 to 2:28. After the race, everyone decamped to Camp & Furnace for the race presentation and watching a certain match (COME ON ENGLAND) on the big screen. Special mention to Road Runner Gaz Roberts as the first team member home, in a race position of 36th and overall time of 6:24 for 52 miles, having been hotly pursued by John Evans for most of the week (who had been hotly pursued by Dave Ward and Dave Berry). Road Runner Helen Parton was the first team female home in an overall time of 08:11, very closely followed by Sarah Rogan in 08:21.